There must be a difficult balance to strike when deciding to build gaming experiences out of real-life events. It can be considered a relatively common practise for the likes of war scenarios; however, the balance comes in when you must consider the amount of relevance and respect that needs to be given to the subject matter. 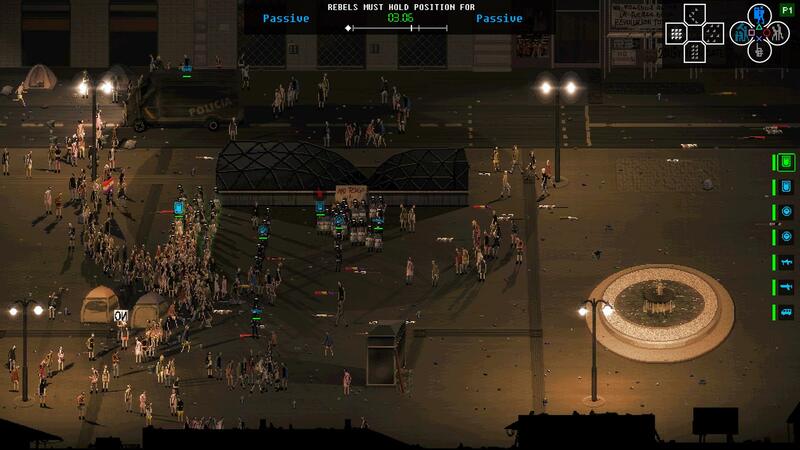 For some time now, the likes of Battlefield, Call of Duty and others have walked a fine line between entertainment and reality, often leaning to the former, but what happens when you need to make something like Riot: Civil Unrest, a title that seeks to explore some very real scenarios with mechanics that reflect the event, yet still acts as a game? As it turns out, that balance is incredibly difficult. Beyond the initial splash screen detailing that the game is based on real events and that players should consider researching to garner their own opinion, the gamification appears almost immediately after with its pixel art graphics and rocking soundtrack. It’s so stark in the immediate contrast that it is somewhat baffling. It’s almost as if the small team at Ivan Venturi Productions are trying to showcase Riot: Civil Unrest as a think piece, but it’s hard to argue this when the concept of high scores and the blood red lettering of the logo become a large focus of the proceedings. The choice of language to depict both sides of the conflict is telling also. I’m sure that trying to take a fence sitting standpoint on the idea of riots is difficult, but is “rebels” the best term you can come up with for the discontent? Gameplay wise, there are three modes, Global mode, which sees you embark on a campaign where the actions of your previous plays have an effect over the next. Story mode which is a basic episodic experience where you can select certain campaigns as they progress over five chapters each with similar gameplay to global and multiplayer which pits two to four players as they control both sides of the conflict, as the rioters or law enforcement which is called in to deal with them. Of the bunch, Global Mode is the most interesting, as actions tend to have more consequence over the campaign than in any other mode and this is the case for either taking the police or rebel side. 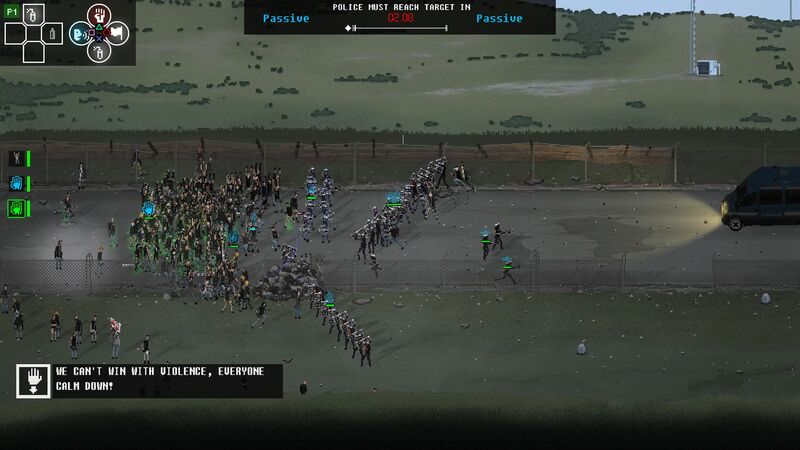 To progress in this mode, you must complete a series of objectives, one at a time in the form of chapters, these can range from; destroying an objective held by the opposing side, getting your crowd or team to occupy an area while not letting the other side in or by protecting your side against an onslaught of the mob or police as they try to charge in (among other objectives). These objectives are also based on aforementioned real world events. One particular scenario takes you through scenarios based around the Arab Spring protests of 2011, seeing you take part in events such as the Friday of Anger. Other events take you around the globe to europe, where you can take part in protests against illegal construction sites and poorly thought out railway projects. There are a few ways to achieve this goal and this is by far the strength of Riot: Civil Unrest in this mode. Every action you take is watched by a meter above the action which blips from Passive to violent depending on how you play. Violent actions often gain you better and quicker results in a mission, however there is a political favour meter to consider also. Overplay your hand violently and while you may win the objective, you will lose the support of onlookers and social media, which leaves you at a disadvantage when the next round comes by. This standing is important, as it governs the number of followers that turn up at the next demonstration, how many resources you can work with and how strong the opposing side will be. 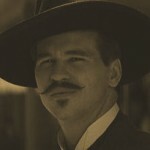 With the above in mind, it is often the best way on either side to take a passive stance and edge your way forward to where you need to be, only unleashing a volley of fists, Molotov cocktails or batons when the other side loses patience and decides to force their way. Speaking of actions, there are several means you can employ to have your voice heard or silenced. On the rebel’s side, you can employ both passive and aggressive tools to get your way. Passively you can rally your crowd using a shout that calms anxiety and employs discipline over the group. Another powerful tool at your disposal is one of the simplest. Tapping the circle button makes the controlled crowd put up their arms and stand firmly in place, creating a block for any law enforcement that try and push in, a further modifier of this tells the group to sit down while doing this to make them even harder to move. There are other ways to gain favour in the outcome, you can use the power of social media to call in reinforcements, should the police act too violently with no provocation at your side, this is especially helpful when you can see the other side escalating and need some extra fists to join in the fight should you need to do so. On the violent side of the spectrum, you have a few tools at your disposal, such as Molotov cocktails that cause the police to retreat, rocks can be thrown at the law for intimidation and you can even utilise crudely made rocket launchers that create a brutal spectacle when times get tough. From the law enforcement angle, you have a lot more options in terms of tactics and loadouts to employ. In your arsenal you have access to formations, squad units, non-lethal and even lethal methods to quell the tide of unrest. You’re mostly at a disadvantage on this side of the fence as you are grossly outnumbered, it’s also incredibly difficult to employ tactics that are considered non-violent, as actions such as shooting gas grenades into crowds for scattered dispersal and marching with shields raised can easily be considered provocative in terms of tactics. As an idea, this is somewhat interesting and being able to play both sides and utilise various methods to get a job done is fine and all. However, the main issue is that none of these systems, are explained in any meaningful way for assistance in starting out. This is further marred by some of the worst controls I have ever seen. The main issue being that controlling the rebel side becomes an ordeal just to how uncontrollable people can be. You use the right stick to select different groups within the overall protest crowd and you can selectively switch between the actions they perform, but as individuals run and scatter or get hurt by attacks, it becomes incredibly unwieldy to maintain any semblance of control. This gets worse when you start getting into violent confrontations, it’s difficult to figure out whether your units are succeeding or being laid out by a truncheon. After a while of playing and trying to utilise any sort of strategy, I found the best way to play was to simply press my left analogue stick towards the objective and then press any action that was off cooldown. If any units decide to run away I would simply just switch to them and then and repeat. It’s the gaming equivalent of smashing two action figures together to make them fight, in action it’s quite dull and beyond a stretch of the imagination, it just looks ridiculous. There is some further things to consider on both sides, such as special protestors who essentially lead your crowd based on their attributes. For example, you can unlock a speciality class that does a good job of keeping your crowd calm and stands their ground against the police. Others can provide combat benefits, providing extra firepower in heavy confrontations. Most of the time these guys feel superfluous. One such character i unlocked was relatively harmless on his own, but incited the crowd to random acts of violence. Thist just ended up making things more difficult than they needed to be and ultimately, because it’s quite hard to see what is going on, you cannot really see the benefit of such units in action all that well. What really hurts the experience however is how the action on screen is depicted. Riot: Civil Unrest uses a stylised and minimal pixel art aesthetic which would look great if we were talking about smaller groups of characters on screen. However, when we are talking about groups of 200+, the screen becomes impossible to read. The only help you have with this is a social media like blip in the bottom left or right corners depending on which side you pick. You can see messages like “OMG they killed him” or “We need to start fighting back” but again, with everything else going on screen, this information is a case of blink and miss. For some strange reason also, part of the status details and unit selections were cut off from my screen, as if the image was too big for the TV window. I checked all possible settings on my console and there were none to fix this in game and it can be especially annoying when trying to read which group you are selecting during a round. I’m aware that some of the detractions i have raised against Riot: Civil Unrest could be considered plus points if we were talking about the game as a simulator, particularly when discussing uncontrollable rioters and issues regarding a lack of direction in certain objectives. The problem i find is that there are many elements suggesting that this should be a game played for entertainment. Because of this cognitive confusion, it’s hard to decipher what the actual intent of the title is. From this, Riot does not seem to succeed at either as the game offers nothing constructive to add to a political conversation and neither is it all that fun to play. 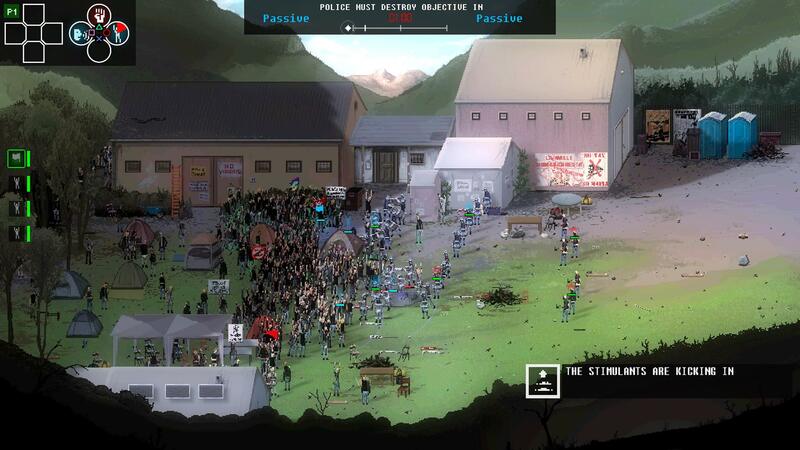 It’s quite difficult to ascertain what Riot: Civil Unrest wants to be. The dull and uncontrollable action would fit quite well as a simulator with something to say. However, the title is bogged down with gamified elements that suggest that this product was built for entertainment, with its guitar laden soundtrack and high score chasing elements. Unfortunately, it becomes a mess of both worlds that fails to be either thought provoking or an enjoyable gaming experience.